Posted in: Public Outreach. Tagged: astronomy, exoplanets, Proxima Centauri. With the recent discovery of an Earth-like planet around the star Proxima Centauri, the nearest habitable world beyond our Solar System might be right on our doorstep. Celebrate this revolutionary find with Boise State’s Physics Dept on Friday, Sep 2 from 7:30p till 12a. The event will kick off in the Multi-Purpose Classroom Building, Lecture Hall 101 (right across the street from the Brady Street Parking Garage) on Boise State’s campus with a public talk on the planet’s discovery from Prof. Brian Jackson. Then at 8:30p the event will move to the Boise State quad (next to the Albertson Library and near the center of campus) the top of the Brady Street Garage (just off University Drive near Capitol), where telescopes will be set up to view Mars, Saturn, Uranus, and Neptune. More information is available at bit.ly/BSUProximaEvent or from Prof. Brian Jackson (bjackson@boisestate.edu — 208-426-3723 — @decaelus). Posted in: Brian's Presentations, Meetings. 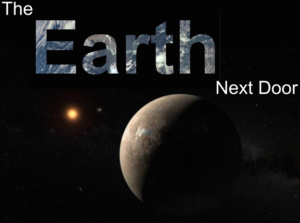 Tagged: astronomy, close-in exoplanets, exoclimes, exoplanets. Beautiful Sky Pilot Mountain, south of Quest University. The last two days of Exoclimes 2016 were as engaging as the first two — lots of great talks, discussion, and coffee break snacks. The day 3 talks that really grabbed me were the first talks, focused on atmospheric mass loss from exoplanets since I’m currently working on that problem myself. Ruth Murray-Clay gave a nice review talk about the variety of different mechanisms and regimes for atmospheric escape, while Eric Lopez suggested that, because escape should preferentially remove lighter elements from atmospheres, short-period exoplanets might retain water-rich envelopes, which could help us constrain their atmospheric compositions. Patricio Cubillos picked up on an idea previously explored by Owen and Wu and suggested that we could use mass-loss considerations to constrain the overall properties (density, etc.) of some short-period planets. Other talks that stood out for me on day 3 included Eric Gaidos‘s talk about looking for geoengineering efforts by alien civilizations and Mateo Brogi‘s talk about measuring the spin rates of distant exoplanets, including GQ Lup b, a brown dwarf/high-mass exoplanet with a spin period of 3 days. Day 4 of the conference whizzed by with a variety of talks regarding clouds and hazes in exoplanet atmospheres. Sarah Hörst taught us we should use the term ‘aerosol‘ instead of ‘clouds and/or hazes’ (since we’re not sure which of the two we’re seeing in exoplanet atmospheres). Joanna Barstow and I rounded out the conference. She talked about her work analyzing exoplanet spectra and constraining aerosol (not clouds and/or haze) properties. Drawing upon the liturgical texts from the dawn of exoplanet science, I talked about my group’s work looking at Roche-lobe overflow of hot Jupiters (I’ve posted my talk below). Posted in: Meetings. Tagged: exoclimes, exoplanets. The first and second days of the Exoclimes conference were just excellent. The indefatigable Andy Ingersoll opened the conference with a brilliant review talk comparing the state of exoplanet science to the development of solar system science over the centuries, and he suggested in exoplanets we are at the same point solar system astronomers were 50 years ago. As the day progressed, we toured the universe, learning about the connection between a planet’s mass and composition, visiting Saturn’s moon Titan, and exploring the atmospheres of exoplanets, both via transit and by directly imaging the planets. Dinner at Howe Sound Pub for a pint of their Super Jupiter ISA capped off the first day of the conference. The second day started with a focus on the connections between geology, life, and climate for Earth and how we might expand that understanding to exoplanets. One talk that particularly stuck out for me was Robin Wordsworth’s talk about how the eruption of a large igneous province in Canada 720 million years ago (the Franklin LIP, as it’s called) may have catalyzed the Sturtian Glaciation, which provided a cautionary tale against making simple connections between the insolation a planet receives and its climate, the usual approach in exoplanetary astronomy. 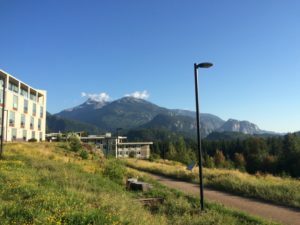 After a visit to the Sea-to-Sky Gondala around lunch time and some spectacular views, the conference reconvened to discuss planets around low-mass stars. Since low-mass or M-dwarf stars are so small (less than half the mass of our Sun), finding and characterizing planets around them is a lot easier than for stars like our Sun. But M-dwarfs can be very different from Sun in many ways, and so it’s hard to know whether Earth-like planets around these stars would actually be Earth-like. For instance, Antigona Segura discussed the effects of M-dwarf flares on the atmospheres of Earth-like planets and showed the flares can induce complex (and even potentially fatal) chemical changes in the atmospheres. Since M-dwarfs flare much more frequently than the Sun, it’s possible that life might be challenged on a planet orbiting an M-dwarf.